What can one say about the infamous, beautifully designed and executed Lexus LS500 sedan? It’s the best of the best and stands above most others in this somewhat fading category. The Lexus500 “prestige” luxury sedan is available in three iterations: LS500, LS 500F-Sport and LS500h. Our LS was equipped with Lexus’ 3.5-liter Twin Turbo engine, V8 matched to a CVT transmission. The week’s drive included both city driving, short trips and over the highway, between Indianapolis and Chicago, in mild weather. What can be said about this luxo-boat when traveling across the highway. It goes without saying as there are few who match this vehicle. One can tell by our review this is a favored sedan, although its practicality is questionable, in today’s car price world. The twin-turbo V6 is also available and new to the brand. The LS500h hybrid edition ups the mpg to about 33 mpg, with 354 horsepower. What was noticeable on Indy’s pothole-filled streets was the way the LS navigated the rough roads. Gingerly going over local side streets took some concentration (over protective! ), but the Lexus’ tuning made it possible to take these concrete pavement and potholes with confidence. As one would expect the interior is constructed of the best materials, including fine leather seating, with 28-way adjustable seats. A match with to its European rivals, the LS is top-notch. We especially liked the updated Z-styled headlights, supremely comfortable luxury features. The LS’ new wheel design is particularly handsome and we’re growing very fond of the darker wheels; in this case the dark-silver alloy machine finish. Trying to miss low curbs and any other obstructions made this writer nervous. What we didn’t like was the LS’ infotainment menagerie. The driver has a difficult time trying to find a radio station, change the temperature inside the cabin or do anything else while driving. Too dangerous. Too complicated. There isn’t a lot to dislike about the LS500, but one nit-pick might be the spring-like ride; not as sophisticated as we would expect, although hardly worth crabbing about. Steering resembles that of a large sedan; a tad floaty and somewhat imprecise, but then, we’re not driving a “performance” car. And again, the difficult to figure out infotainment system. There isn’t anything to dislike about the Mark Levinson 23 audio system with 23 speakers. We regret not taking more time to just sit and listen to the Levinson, exploring different types of music. Our test LS500 included the F Sport Package which we very much favor. Included in the package is the F Sport exterior styling, front bumper, mesh grille inserts, rear diffuser and lower door trim, six-piston front brake calipers w/15-7-in ventilated discs, four piston rear brake calipers with 14.1-inch variable suspension (AVS), LFA-inspired sliding instrumentation, F Sport trimmed steering wheel and shift knob with Ultrasuede headliner, F Sport 28-way power-adjustable front seats and embossed headrests, aluminum pedals and interior trim. It’s a beauty. There is a little more engine noise, improved handling and additional sport drive select modes if you prefer to change your driving feel. The newly designed LS does feel smaller than it’s size and when stepping out of it, a look back reminds you how big it really is. It resembles, somewhat, the sedans (“boats”) of old, yet not floaty. Options on our press vehicle included just two packages: The Mark Levinson audio system with 23 speakers ($1,940), and 24-inch heads-up display (HUD), which more than once talked back to me. Someone who drives two-footed, more than once I was told that my brake pedal and gas pedal were being pressed simultaneously!! I loved it. The F-Sport leather heated steering wheel came at no extra charge. Nice on cold days. 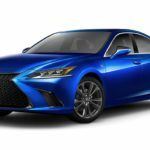 The freshly designed 2019 Lexus LS500 now includes Apple CarPlay compatible with Amazon Alexa, and amazon Echo and Android Auto. A 12.3-inch infotainment display with touchpad interface is standard. Responses are slow when operating the touchpad, and as mentioned, awkward while driving. If you’re interested in a hybrid, the LS is offered in one with a 3.5-liter V6 engine with two electric motors, 44-KWH lithium-ion battery, trick 4-speed auto transmission made just for the hybrid version. One motor is in use at lower speeds while the gas and second electric motors kick in for more power at higher speeds. The hybrid cannot be plugged in, and the small battery can only handle a few miles of electric-only operation. Average mpg is 33 mpg. The 2019 LS500 sports a 1.3-inch longer wheelbase, up from the previous generation. Seats are heated and cooled, and a 22-way option with a raised ottoman is standard. If your back gets a little sore, you can choose from multiple massage styles! One can choose from 10 exterior colors; ours was the elegant Liquid Platinum (silverfish). And of course, all the most up-to-date features are standard, some of which include driver/passenger folding mirrors when car is turned off, integrated key remote, cruise with dynamic radar, cruise center lane dis., navigation, 12-speaker audio system with Bluetooth, USB, active noise cancellation. Because so much is included in a base LS500, few options are available: The Mark Levinson Audio System, F Sport trim, Executive Pacakage. 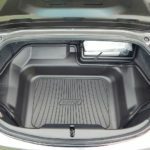 Trunk Capacity: 16.95 cu. Ft.
Fuel Tank Capacity: 21.7 gal. Warranty: 48/50,000-miles Bumper-to-Bumper, 72 mths/70,000-miles Roadside Assistance, 72 mths/70,000-miles Powertrain. 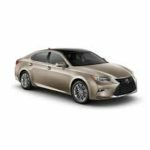 All-new for 2019, the once stodgy Lexus ES 350 has moved into the much-desirable category of sedans. Who says sedans aren’t a ‘choice’ of vehicle today? We understand that the stats show many drivers moving into SUV’s of all makes, but there are still some of us that prefer a beautiful luxury sedan; particularly one with sport overtones. Our 2019 Lexus ES 350, with F-Sport package, is just that: A beautiful-and in our case-Ultra Sonic Blue Mica 2.0-sedan. One will recognize the F-Sport version from the regular ES 350 with one glance at the grille; a blacked-out pattern. The F-Sport version also moves up to the LC-inspired 19-inch wheels. 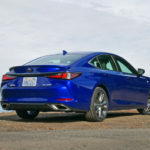 Driving the 2019 Lexus ES 350 was a pleasure and took this writer just a short time to figure out how it all worked inside. As expected, the audio, high-tech Nav system are all available; standard with the Nav/Mark Levinson Premium Audio Package, which was an option on our test ES 350 F Sport. 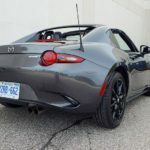 The navigation with a 12.3-inch split screen multimedia, voice-activated Nav system that can map zillions of points of interest, traffic and weather, and display the current speed limit, as well as locate nearby gas stations. Standard on our ES 350 F Sport was the Amazon Alexa, used just as one does at home. 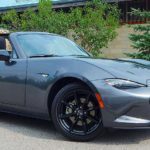 It also syncs to the Nav System, and can be used to control compatible Smart-Home devices, as well as listen to audiobooks, stream Amazon music and check weather, or news briefings. 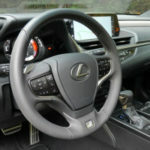 Among other standard and optional high-tech features are Enform Remote, Apple Car Play, Lexus Enform Wi-Fi, Lexus Enform Dynamic Nav, Enform App Suite 2.0, Lexus Enform Service Connect, Drive Mode Select, Custom Drive Mode, Sport S+ Driving Mode, and of course, SiriusXM Satellite radio, among other expected amenities. No longer in the “dull” category, the 2019 ES 350 has every ‘extra’ you’ll need, and desire. Preferring a ‘performance’ car in our driving life, the ES 350, with F Sport felt much like a BMW in more regards than in the past. No longer ‘anonymous,’ the ES engages you when in the driver’s seat. Alongside the re-designed LS sedan, they resemble royalty in any garage. Consumers won’t be disappointed in any of the ES versions, but if you want a sports-car feel, in a practical sedan, the F Sport model won’t disappoint. Equipped with the optional Adaptive Variable Suspension (of LC fame), the dynamics are much more fun. If you prefer a sports version, the F Sport is for you, without question. We prefer the Sport/performance version of most sedans. However, even the base ES sedans will please drivers; as they are equipped with swing-valve shock absorbers that soak up bumps well, while keeping the car on track. Side point: This is very important in Indianapolis as this is the city with the most potholes! No contest! It is difficult to be critical about a Lexus product, although “purists” may argue this point. The ES F Sport, however, does resemble the BMW M550 in certain ways. Now, some may disagree, and that’s all right, since this writer isn’t a track champ. But if you’re also seeking luxury along with a sport feel and performance, the ES won’t disappoint. Take a test drive, preferably, back-to-back with the BMW M 550. As the years have passed, the once “bland” Lexus products aiming to be ‘mainstream” have since evolved, considerably. They are worthy of most drivers who want excitement and challenge; anything different than the average 4-door sedan feel. If you need that sedan-to cart around your 90-year-old parents-you, at least will feel a compromise on the side of style and performance. Once you drop them off, you’ll want to push the pedal to the medal so it can do its thing. And for this writer, there is something about driving a beautiful automobile. A lot of the ‘sport’ feel is sensed through the F Sport steering wheel, and through your heels resting on the floor. The new seating is placed lower and more comfortably, enabling the driver to handle this sporty sedan more confidently. The 2019 ES 350 is one of those cars that manages to feel smaller than it is and wrap around you as you guide it along. It may be based on the Avalon, but the large size Toyota never felt as graceful and responsive as its Lexus cousin. The extra structural rigidity of the ES is part of the equation. This review is of course, based on the ES with the F Sport package. The sport model that is fitted with the optional Adaptive Variable Suspension derived from the beautiful LC, which no doubt helps the dynamics compared to lesser ES trims. For anyone who aspires to driving a car with a true sport feel, yet the amenities of a sedan, adding the F Sport is a must! Nix. No pups in this luxury mobile. Period! Gallons per tank: 15.9 gal. 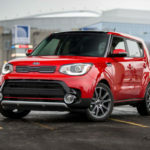 IIHS has chosen it’s ‘best of the best’ vehicles for the year 2019. Last year, only 12 vehicles initially qualified for the top category. Another 27 qualified as IIHS Top Safety Pick Winners. 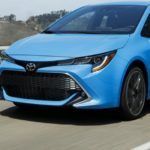 As automakers continue to make needed changes and improvements, it becomes a little easier to name new cars the “best.” Qualifications by IIHS have been tightened for 2019, including an increase in crash-test standards. As expected, many major brands were in the top running, including Subaru, Kia and Hyundai. Stricter standards require automakers to get at least a “good” rating in a passenger-side crash test which assess the vehicle’s performance when the front-right corner smashes into something. Also required in the Top Safety Pick list are “good” headlights. Most of the vehicles to qualify must have the optional upgrade packages that have better functioning headlights. The IIHS has found that many vehicles available do not provide sufficient nighttime illumination due to poor manufacturing, inadequate design and outdated regulations. Insufficient illumination has been the reason no pickups and some popular SUV’s have not been on the list. Minivans: Chrysler Pacifica, Honda Odyssey. There were, of course, those brands that did not make the list in any category. Those included General Motors, Ford Motor, Tesla, Volvo, Fiat Chrysler’s Jeep, Ram and Dodge. Next on IIHS’ list will be coming up with measures to assess each vehicle’s performance on pedestrian safety, amid heightened awareness of the pedestrian safety crisis. On that list will be some kind of emergency braking with pedestrian detection. Still a popular pickup, the Toyota Tundra appears to be aging and not in full step with say, the Ford F-150. However, even with all its worthy competitors, the Tundra still sells well and is a ‘luxury’ truck of immense size. Toyota’s first attempt at a full-size half-ton truck, the Tundra’s competition is plenty, and includes GMC Sierra, Ram 1500, Ford F-150 and Chevrolet Silverado. While the Tundra still sports the 5.7-liter V8 powertrain, the competition has adopted more efficient engines, such as diesel and turbocharged V-6’s. This, of course, affects fuel economy and even at 18 mpg on the highway, the Tundra isn’t measuring up. Held up against the other trucks out there, the Tundra doesn’t look much different, or dated. A little more simple, perhaps. Frontend updates and some additional safety equipment have been added for 2019. Modern conveniences such as rear-backup camera w/touchscreen, six airbags, tire pressure monitor, pre-collision system with pedestrian protection, Dynamic Radar cruise control, Lane Departure with Alert, with sway warning system and automatic high beams, abound; along with all the up-to-date safety features. Our test Tundra, Limited edition, came with leather-trimmed and heated 10-way power-adjusted passenger front bucket seats. 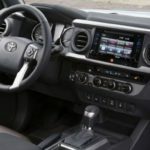 The sound system is also up-to-date with Entune Premium Audio with navigation, App Suite, 7.0-touch screen w/backup camera, AM/FM/CD, Phone, Music, Siri Eyes, 3-month free Sirius XM. And, of course, a full tank of gas! Trim levels consist of the SR, SR5, Limited, Platinum, TRDPro and the 1794 edition. Pricing falls between $31,420-$50,430. Oh, and a full—size spare is standard. We had both the opportunity to drive the Tundra Limited around town as well as the distance from Indy to Chicago. It handled well on the highway, quietly and with little sway, which is more obvious when driving in-town. Getting used to the great-sized mirrors took some time, particularly, when navigating narrow streets. Thanks to the help of backup cameras and rear-parking assist and blind spot monitor available on the optional Limited Premium Package ($1,065). Last refreshed in 2014, the Tundra was offered in 2018 as Double Cab and the larger CrewMax. Customers had the choice of 5.6-ft., 6.5-ft. or 8.1-ft. cargo bed, 4.6 V8 or 5.7-L V8 engines, 2 or 4-wheel, with 6-speed transmission. I had hoped the truck would be a pleasurable ride for the Fab Four but instead, they cowardly climbed into the rear seats-with help, of course, as none of them could jump that high. We then tried out, or tried to, the bed, again too high for them to navigate the jump alone. Once Lucy (Chihuahua) and Gypsy (Whippet), the two “Wild Childs” were up in the bed, they became afraid-very afraid. Maybe it would just take a little time, but they both wanted off that bed, immediately. Too bad, I’ve often considered getting a truck, thinking it would suit them-dogs-just fine. Guess I’ll be rethinking that idea. Too much work for me. 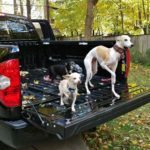 A simple command for my dogs isn’t going to get them to jump up into a truck! Spoiled?? The horizontal rear window is power with privacy glass. So the pups can watch the road-backwards. If you’re wondering about room, though, the rear seats offer plenty of space for dogs, even four! My pups are small and medium, but any dog would fit. And it’s a comfortable ride. Room in the rear seating is generous, with a 60/40 split seat. The front seating is a 40/20/40 split-fold down front bench. Although it’s never a good idea to ride in a truck with dogs in the bed, people do it. It’s dangerous, even if they are crated. And, some breeds may be better suited for bed riding; think Labs or Aussies. The 6.5-ft. double-walled bed has rail caps and is sturdy and accommodating for other cargo. A deck rail system is equipped with four adjustable tie-down cleats to hold things in place. Options: Running boards ($345); Limited Premium Package ($1,065 includes front/rear parking assist, Sonar, Blind Spot Monitor, rear Cross traffic Alert (upgrades in color-keyed rear bumper), Power Windows with Driver and Front Passenger Auto up/down, Anti-Theft system with alarm, Glass Breakage sensor, Engine immobilizer); TRD Off-Road Package ($70, includes upgrades standard wheels to 18 split 5-spoke TRD off-road package alloy wheels and P275/65R18 tires, includes Trail Tuned Bilstein Shock Absorbers, Engine skid plate, front tow hooks (4×2 models), standard on 4×4 models. LED headlights, LED fog lights (on 5RS and Limited models and 1794 edition models), TRD Off-road floor mats(on 5RS and Limited Models), and Bedside TRD Off-Road Decals). 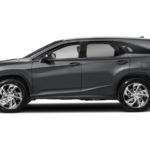 Equipped nicely and without want, the 2018 Lexus RX 350L has grown in size and feels much larger than the original RX. And women like driving this? It seemed large to this writer. But, the ever-popular Lexus RX still reigns and is sought after, despite its high price tag. Our 2018 LX Luxury edition came at a cost of $61,660 total vehicle price, with a couple of options. To be sure, there isn’t anything wanting, and the options add up to high numbers. For instance, options included were Blind Spot Monitor with Rear-Cross Traffic Braking and Intuitive Park Assist ($1,065), Cold Weather Package (windshield deicer, headlamp cleaner, $200), Triple Beam LED Auto Leveling Headlamps w/washers, cornering large LED front turn signal lamps and rear combination lamps, $1515; 12.3-inch Navigation System Mark Levinson 15-speaker Premium Audio Package, Lexus Enform Destinations (1-year trial), subscription, Lexus Enform App Suite, $3,200. I guess one can expect to pay upwards of $50,000 today for a premium, large SUV. And because Lexus tops the market, it may be a fair ask. We enjoyed driving the RX but found it too large for our taste. Are consumers really wanting a much larger SUV these days? Guess so. Our test Lexus RX came equipped with all that’s expected, including a powerful V6 engine, Full-Time Active Control All-Wheel-Drive, ABS, Brakeforce Distribution/Brake Assist, Rain-sensing wipers, Lane Departure alert w/steering assist and lane keep assist, Theft Deterent system, Scout GPS Link, Rear Door Sunshades, 12-way power semi leather-trimmed front seats, heated wood steering wheel, Aluminum roof rails, LED ambient illumination, power back door, power tilt/slide moonroof, Push button stop/start, and 4.2 Multi-information Display with Lexus personalized setting, among other goodies. We thought the driver’s seat sat tall, although adjustable. It felt as though we were steering a large ship, and noticed at times, it didn’t always hold the road as well as expected. It’s hard to fault a Lexus product, and often there isn’t much that’s negative to note. However, we didn’t enjoy driving the RX as much as other Lexus products. Seats are large and accommodating for all body types. Controls are fairly intuitive and don’t’ take a large learning curve, which is staying a lot for this writer. Skipping some of the extras (options), buyers can expect pricing to hover around the low $50,000-mark, but discounts do exist. The RX is a refined third-row luxury SUV based on the Toyota Highlander/Kluger, and offered since 1998. A hybrid version is also available. It’s, as expected, quite and smooth. However, we noticed more wind noise than expected this time around. A fault of this particular press car, or are they getting sloppy? We also noticed when taking corners, the RX felt heavy. And third-row seating isn’t always what you think it’s going to be; meaning, adults will be snug. The Frissell 4 rode back/forth to Chicago from Indy. Huddled In the adequately covered back seat, mostly sleeping. Space is plenty and the Chihuahuas took to curling up on the floor, which offers a wide space between front/back seating areas. Height proved an issue for the little ones, as well as our 12-year old Whippet, meaning, they were air-lifted in/out of the RX. If time hadn’t been tight, a great picture of them all looking into the front seat from the back would have been taken. Generally, the 4 behave quite well. If I owned the RX would I allow them to travel in it? Not sure. Would like to think the RX would be the one car that would be kept pristine. 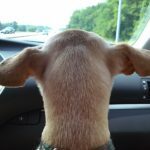 Generally, good choices for toting dogs, SUV’s closely follow the smartest car on the road, the Minivan. Fuel economy isn’t stunning, but this is a heavy vehicle at over 4,000 pounds. So averaging 23-25 mpg. On the highway was about standard. We weren’t complaining. We’ve noticed a return of the Heads-Up display in vehicles. Is this due to the aging population of drivers? I do have a 2003 Corvette that has a Heads-Up display, and although in the past, I regarded it as ‘silly,’ I’ve begun to rely on it. The color heads-up display in the RX ($600) may not be needed by all drivers, but like all special options, once you become accustomed, you rely on it. 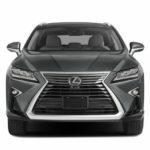 Competition for the RX 350 includes Acura MDX, and Infiniti QX60, among others. Leather seats are not standard on the RX, a surprise at this pricing point. MSRP: $54,085; total vehicle price $61,660; destination $995. EPA fuel economy: 18/25 mpg. , 21 mpg./ avg. Fuel Tank Capacity: 19.2 gal. As it does every year, Consumer Reports rates the automobiles, top, bottom and in-the-middle, for reliability. This year, 2018, it is again no surprise who is at the top of the list. 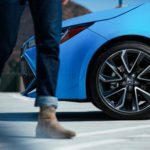 Lexus and Toyota vehicles are tops, followed by Subaru, Kia, Infiniti (top six spots), and Mazda-who took a huge leap from 12 to number three. 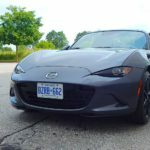 Go Mazda!!! The German brands fell in the middle, coming in at numbers 7-9; Porsche at 11, VW at 16 and Mercedes-Benz at seventeen. However, Acura is up 6 spots, thanks recently to working out transmission and infotainment problems. Left at the bottom, however are the American cars, with the exception of Volvo, which is literally at the bottom, ranked 29, in part, because of issues with the XC60 and the XC90, as well as complaints about engine knocking or pinging on the S90. Ford sits at number 18, and Buick dropped a whopping 11 spots, to number 19. Consumer Reports attributes the giant drop of GM’s mid-level luxury brand to the Enclave’s 9-speed transmission woes. The Lacrosse, Encore and Envision rated average. Lincoln, Dodge, Jeep, Chevrolet and Chrysler ranked 20 and 24. While GMC, Ram, Tesla and Cadillac are in positions 25 to 28, respectively. American brands that dropped the most were Chrysler (down 7), Tesla (down 6), and Chevrolet (down 5). According to Consumer Reports, Chrysler’s Pacifica contributed to a drop in rankings due to infotainment and transmission issues. Among all the talk these days about driverless cars, we’re reminded of when and where the automobile came. From the establishment of the first automobile company by brothers Charles E. and J. frank Duryea in 1896, to superhighways and green-and-white signs to guide travelers, the advent of the automobile has transformed American life. In 1996, the Henry Ford Museum/Greenfield Village in Dearborn, MI celebrated 100 years of the Automobile in American Life in an exhibition that included more than 100 cars and thousands of artifacts to illustrate how the automobile evolved from the 19th century novelty into a mainstay of American culture. One of the most influential industries in America, the automobile industry is responsible for the existence of such phenomenons as fast food restaurants to motels, to gas stations, Drive-in movies, campgrounds and gas pumps are all a part of the American scene. Significant events in the auto industry include such happenings as a massive oil strike at Spindletop Beaumont, Texas (1901), the introduction of the Model T (1908) by Ford, the first U.S. transcontinental automobile trip (1903), and President Eisenhower signing the Interstate Highway Act in 1956. When considering the automobile, one also thinks of certain people connected with it, including Harvey Firestone, Walter Reuther, Ransom E. Olds, and Ralph Nader. The list goes on and on. Milestones abound when summarizing the U.S. auto industry, beginning in 1896, right up to the present. Of course, a lot of innovations have come to pass since the early days, including electric and hybrid cars, and of course, Elan Musk’s Tesla endeavor. 1)	The car made in Detroit changed the nation. Detroit was the first city to have a large number of cars made and driven. Mass production led to good paying jobs, making it possible for people who worked in the car factories to own cars and drive them to work. As the industry grew, the city grew, making it necessary for developments to accommodate cars. This set the pattern for other growing urban centers. One need only consider Los Angeles, a city where few cars have ever been made, but where most people own one. 2)	Development of the interstate highway system. The nation’s largest public works program, the building of the interstate highway system linked communities, but also cut others apart by using straight lines as the shortest distance between places. In some places, there are still remnants of what was once important (such as on Route 66) but have fallen away as interstate stops became growth areas. Because of car traffic, and a highway system, the expansion of the national parks system was possible, which gave people more places to go. 3)	Suburbanization. Because of automobiles, communities could be built that were neither urban nor rural, but had some of the advantages of both. 4)	Growth of the drive-in lifestyle. Beginning with movies and fast food, drive-ins have evolved to include banks, dry cleaners and even weddings and funerals. 5)	Changing the purpose of the streets. Once an extension of front yards, streets enabled people to walk and vendors to sell their goods from carts. At one time, transportation was a secondary use; now it is reversed. 6)	Architecture of American homes. The elimination of the front porch can be dated back to the rise of automobiles in the late 1920s. Porches became smaller and have now practically disappeared. As garages took over in popularity, the backyard became more of a focal point for relaxation. 7)	Decline of railroads and streetcars. With the increase in popularity of the automobile came the decline of trains, trolleys and inter-urbans as a means of transportation, even before the growth of air travel. In cars, travelers could go where they wanted, when they wanted, rather than having to adhere to a fixed route and time. 8)	Breakdown of rural isolation. Those living in outlying areas of cities embraced the automobile as a means of maintaining their rural lifestyle. The car provided a link between towns and cities. 9)	Becoming the engine that drives an economy. Because of the automobile, oil, rubber and a whole host of industry activities exist. Motels, restaurants and service businesses grew up on trade from drivers. Advertising has also been affected as witnessed by the billboard. Billboards were not just posted along railroad track routes. 10)	Defining the work of the 20th century. Standardization of parts and assembly necessary for mass production of the automobile led to an abundance of high-wage, low-skilled jobs. These jobs made it possible for workers to live a comfortable lifestyle; especially for immigrants who didn’t speak English and/or people who were untrained but willing to work. In the 21st century, workers began moving into a situation similar to the one that existed at the beginning of the industrial evolution: the best paying jobs go to the more skilled workers.